“Even into his early seventies, after a more than fifty-year career, Jim never lost a thing musically or vocally. His solid rhythm guitar coupled with his pure tenor voice, whether singing harmony or as a soloist, was always right on." Eddie Stubbs' eulogy, Bluegrass Unlimited, February, 2003. Jim McReynolds was the elder of two brothers who were separated as musical partners only by military service and death. 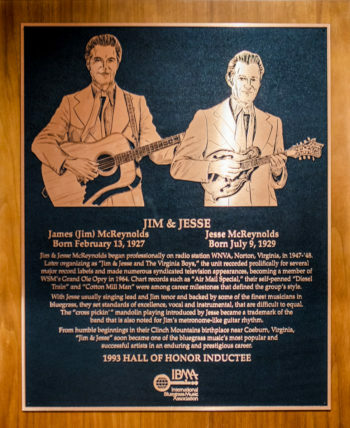 Jim and Jesse performed together, composed together, married sisters, and lived in adjoining residences – the Double J Ranch in Gallatin, near Nashville, Tennessee. So much has been made of the duet that Jim’s remarkable voice seldom received the praise it deserved. A tenor with effortless range, Jim sang high harmonies and the occasional lead vocal with gossamer beauty, far from the strident intensity of most rural singers from the southwestern Virginia and eastern Kentucky coalfields. Remembered as a neatly dressed, quite-spoken, and polite gentleman, Jim McReynolds seldom drew attention to himself. He managed the business of the band, while Jesse was the more visible public spokesman, predominant lead singer, and featured instrumentalist. Jim’s personality showed its strength when the group was treated in a less than dignified fashion or when he bickered with Jesse – as brothers will – about some insignificant matter. The family was musical on both sides, but eked a living from farming coal mining, and during the Great Depression, the WPA. As a teenager, Jim followed his father into the mines but never returned after the senior McReynolds was almost killed in a mining accident. Jim learned guitar and gospel music from his mother. As World War II ended, he spent a two-year hitch in the Army. He returned home with a mandolin and soon joined his younger brother and his sister’s husband in a local dance and radio band. Like all regional acts of the era, The McReynolds Brothers and the Cumberland Mountain Boys moved from city to city, angling for higher-wattage stations and playing out the local territory. When the mines were busy, they found their most lucrative bookings in coal country. During an economic lull there, they accompanied Curly Seckler to Augusta, Georgia, for a short hitch with Hoke Jenkins and his Smoky Mountaineers. A year later, the two brothers tried something uncharacteristic of Appalachian bluegrass musicians – they moved to Iowa and Kansas as singing radio cowboys. The McReynolds’ first television and recording work came in 1951 and 1952 in southwestern Ohio – Middletown, Dayton, and Cincinnati. Ten gospel songs were cut for the Kentucky label as the Virginia Trio. It was in Cincinnati that they auditioned unsuccessfully for King. Then, in one of those unexpected quirks of fate, they ran into Capitol Records’ Ken Nelson at the Jimmie Skinner Music Center, played a few songs for him, and were invited to record in Nashville. Nelson suggested a new name for the act: Jim and Jesse and the Virginia Boys. Capitol sessions in 1952, 1953, and 1955 resulted in twenty tracks, sixteen of which were released as 78 and 45 rpm singles. The most enduring were the Louvin Brothers’-penned “Are You Missing Me,” and the McReynolds’ own “I Will Be Waiting for You” and “Just Wondering Why.” The brothers were working at WCYB in Bristol when Jesse was drafted for service in Korea. Jim farmed from 1953 to 1954. Jesse returned to a changed musical landscape; Elvis had hit and even the most prominent bluegrass acts had trouble keeping a major label contract. In 1960, when the folk boom was attracting urban and college audiences for bluegrass acts, Don Law signed the brothers to Columbia Records. On that label and its subsidiary Epic, Jim and Jesse achieved their first top-100 country chart hits: “Cotton Mill Man” (1964), “Better Times a-Coming” (1964), “Diesel on My Tail” (1967), “Ballad of Thunder Road” (1967), “Greenwich Village Folk Song Salesman” (1968), “Yonder Comes a Freight Train” (1968), and “The Golden Rocket” (1970). In 1964, Jim and Jesse became members of WSM’s Grand Ole Opry and moved to Nashville. With folk audiences shrinking and the bluegrass festival circuit still on the horizon, the act experienced strong economic pressures to record and perform with electric insturments and drums in a mainstream country format. Nine years later, in 1973, they formed their own record label, Old Dominion, and returned almost entirely to bluegrass for the remainder of their career. Successful international tours, Opry appearances, and a steady stream of headline appearances at bluegrass festivals allowed Jim and Jesse to continue as full-time musicians through the eighties and nineties. Jim encountered voice problems at the dawn of the new millennium and was diagnosed with cancer in early 2002. Despite surgeries and chemotherapy, he continued to perform whenever he was able. On December 19, 2002, Jim’s wife Arreta died of a massive heart attack. Jim entered hospice care on December 20 and died December 31. He was buried on a mountain overlooking his childhood home in Carfax, Virginia. Brought a smooth duet style to bluegrass, bridging the brother duet and modern country styles. Member of the Grand Ole Opry, 1964-2002. Jim’s grandfather, fiddler Charles McReynolds, recorded at the historic 1927 Bristol sessions as a member of the Bull Mountain Moonshiners. A 1954 Capitol Records promotion booklet listed the following details about Jesse: height: 5’11″, black hair, grey eyes, weight: 145 lbs., single, favorite food: fried potatoes, favorite color: blue, favorite sports: fishing, hunting. “To really entertain an audience, you make 'em feel sad one minute and then the next one you get into, you get 'em hollerin' and laughin' with you and that sort of rounds out the show." Quoted in Julie Knight, "Hoke Jenkins, Pioneer Banjo Man," Bluegrass Unlimited, September, 1985. "When we first moved to Nashville, bluegrass wasn't doing that well. We had to get something on the record charts before we could get any work. And the only way we could get on the record charts was to get booked country. So that's where we went." Quoted in Robert K. Oermann, "Jim & Jesse: Testing the Boundaries of Bluegrass Music - With a little Help from Charlie Louvin," Bluegrass Unlimited, September, 1982. “Ranger Doug” Green, music writer, historian, and member of Riders in the Sky, in the liner notes to Jim & Jesse: Bluegrass and More, Bear Family Records, 1993.